Are you a breeder or pet owner and with a cavalier of age 6 or older that you think might be a good candidate for a scan? Rupert’s Fund is on the search for older dogs CLEAR of syringomyelia. To date, these have been very hard to find. Researchers know more are out there, but finding them before this research window closes is extremely important! If you think your dog might be good candidate, please contact researcher Penny Knowler for further information. Discussions and scan results are absolutely confidential: results are shared with the owner (unless the owner does not wish to know the result), the genome researchers, and Dr Sarah Blott for the Estimated Breeding Values (EBV) project (more detail below). The researchers are seeking cavaliers of age 6 or more that are believed to be clear for SM. These would be dogs that either have never been MRId and show no signs of SM, or dogs that were scanned clear at a younger age, which continue to show no symptoms. Eligible dogs need to have a Kennel Club registration number (or from another national registry such as the IKC, AKC or CKCSC) so that a pedigree can be constructed. If the owner has a five generation pedigree already, this can be submitted to the researchers. Priority is given to dogs that come from a background considered most useful to the overall genome project, as determined by the researchers. Siblings or closely related dogs are considered especially valuable. Dogs need to be able to get to one of a group of specific scanning centres in the UK. Who chooses the dogs, & sees the scans paid for by Rupert's Fund? ◦Clare Rusbridge and Penny Knowler select the most promising dogs for the project (based on a number of criteria) and then pay for the scan out of Rupert's Fund, which they manage themselves. ◦The scans are then seen by the owner of the dog, and the researchers. As donors will notice when they make a donation, all donations to Rupert's Fund go directly to Penny Knowler in the first place (the SM DNA Research fund). If donors indicate their name may be shared, they will be added to a list of donors here to acknowledge support. Specific amounts given are not noted on the donor list. Scan results and discussions are entirely between the owner and the researchers in the UK and Canada. No report is made back to anyone else -- not to the CKCS Club, the Kennel Club, the donors to Rupert's Fund, the Fund organisers, or to any other individual or group. If owners want to discuss their results, that is their personal choice. Some have shared results to encourage others to scan! For further information, people can speak with Penny Knowler or Clare Rusbridge directly. DO you have a cavalier that has already been MRI scanned? 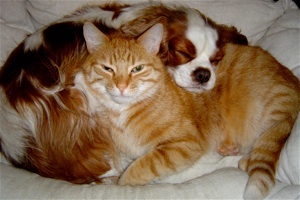 Many pet owners and breeders around the world have scanned their cavaliers either for breeding information or for clinical reasons. These are ALL valuable to research, if the dog has a registration number to a national kennel club organisation, and a pedigree (however a dog does not need to have a printed pedigree -- one can be determined from the registration number of the dog, by researchers). If you already have a scan for a dog that was scanned at age 6+, this may be very useful to the genome work, whatever the result. Please contact the researchers for further information.